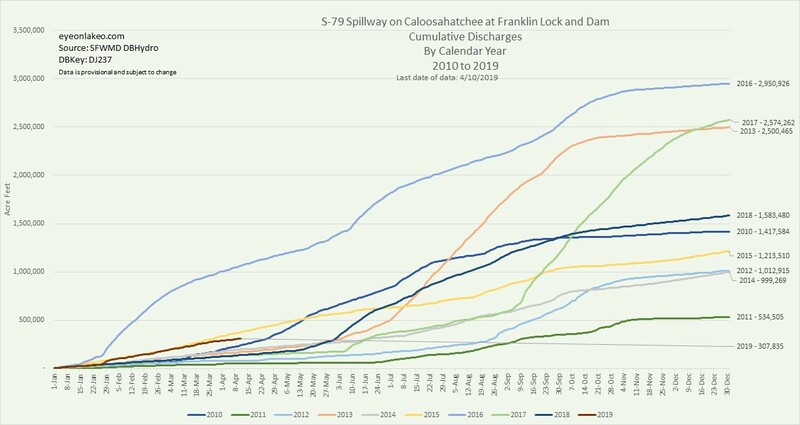 S-79 Spillway Caloosahatchee at Franklin Lock and Dam, Calendar Year 2010-2019, courtesy http://eyeonlakeo.com, Todd Thurlow. Structures along the Caloosahatchee River, courtesy Melody Hunt, Research Gate. S-79 is the gate used for purposes of this post. 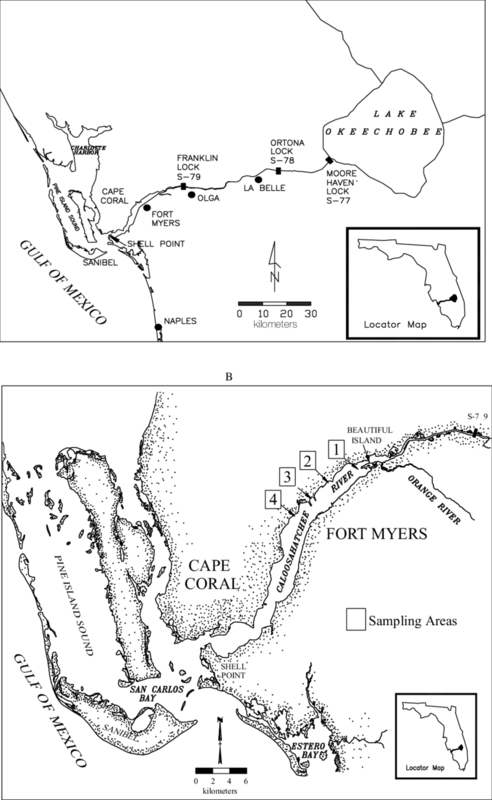 S-79 is comparable to the St Lucie’s S-80 at St Lucie Locks and Dam, in that it is the final structure along a channelized river thus allowing both runoff from the surrounding “basin” and water discharged from Lake Okeechobee. 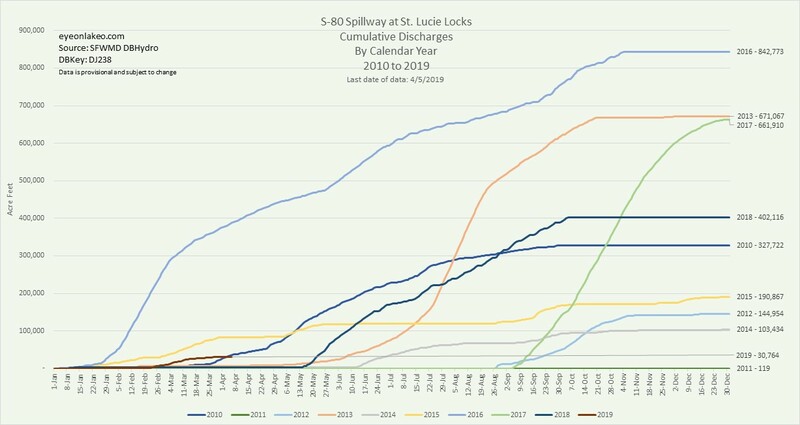 Last week, I presented a blog on discharges, 2010-2019, to the St Lucie River from both the surrounding basin, and Lake Okeechobee. Although we can separate Lake O’s numbers, it is important to know just how much water, thus sediment, nitrogen and phosphorus, the estuaries are taking “at once.” I have often said the worst thing about discharges from Lake Okeechobee is that the river is already on life support -from being drowned out by basin runoff- when Lake Okeechobee is leashed open. So called “basins” around our rivers, like everything else in South Florida, have been altered to drain more efficiently than Nature intended. Thus with “basin discharges” these rivers (St Lucie and Caloosahatchee) are already being drowned out during high rain events, and thus when Lake O’s water comes on top, well, it is the “nail in the coffin” so to speak. I just needed to explain that before we begin…. ~ So today, as in the previous post, I will be speaking about both basin and Lake O water. 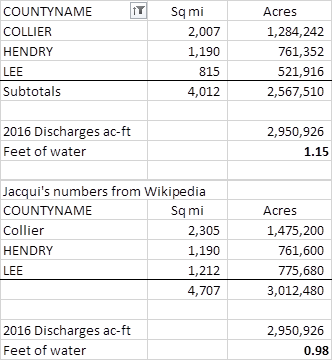 Referring to my brother, Todd’s, graph at the top of the page, you’ll notice right away the destructive-discharge numbers are much larger for the Caloosahatchee, than the St Lucie, as it is much larger estuarine system. 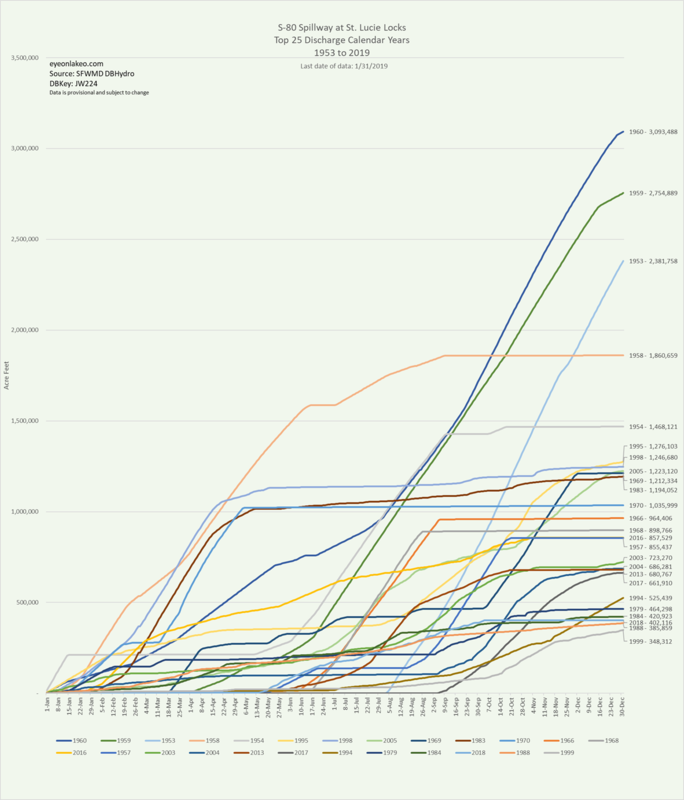 As we can see comparing the two charts labeled “Cumulative Discharges 2010-2019” below, both the St Lucie and the Caloosahatchee’s highest year for discharges, by far, was 2016. But whereas the St Lucie received 842,000 acre feet of water, the Caloosahatchee’s water number is a whopping 2,950,926 acre feet! That would mean one foot of water on 2,950,926 acres of land. You’ll remember from last time that “acre feet” is a very easy way to calculate. “Acre feet” means one foot of water on top of one acre of land. 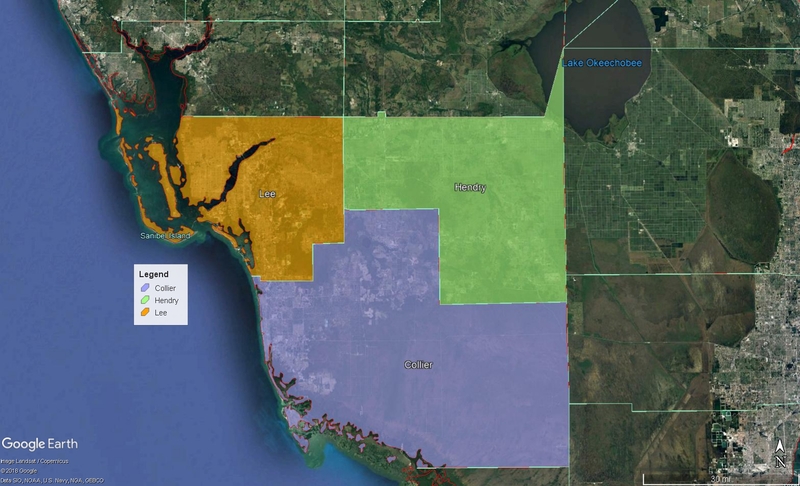 This 2016 Caloosahatchee 2,950,926 acre feet of water would just about cover, by one foot, Lee County, Collier County, and Hendry County – counting land and water within boundaries – as the acreage of these three counties adds up to 3, 012,450 acres. Lee, orange; Collier, blue; and Hendry, green equals 3,012,450 acres of land so 2,950,926 acre feet of water would just about cover this area. Again, this visual is meant to give perspective on the tremendous amount of land this amount of water would cover. Often when we hear “acre feet” we don’t put “two and two” together. Once one realizes the number of acres of land that would be covered, it is astounding! ~But then, of course! These waters used to flow naturally as sheet-flow from the Shingle Creek area up in Orange County all the way south to Florida Bay. Continuing on, we see that in second place, although the St Lucie’s second worst year was 2013, for the Caloosahathcee it was 2017, and then 2013. 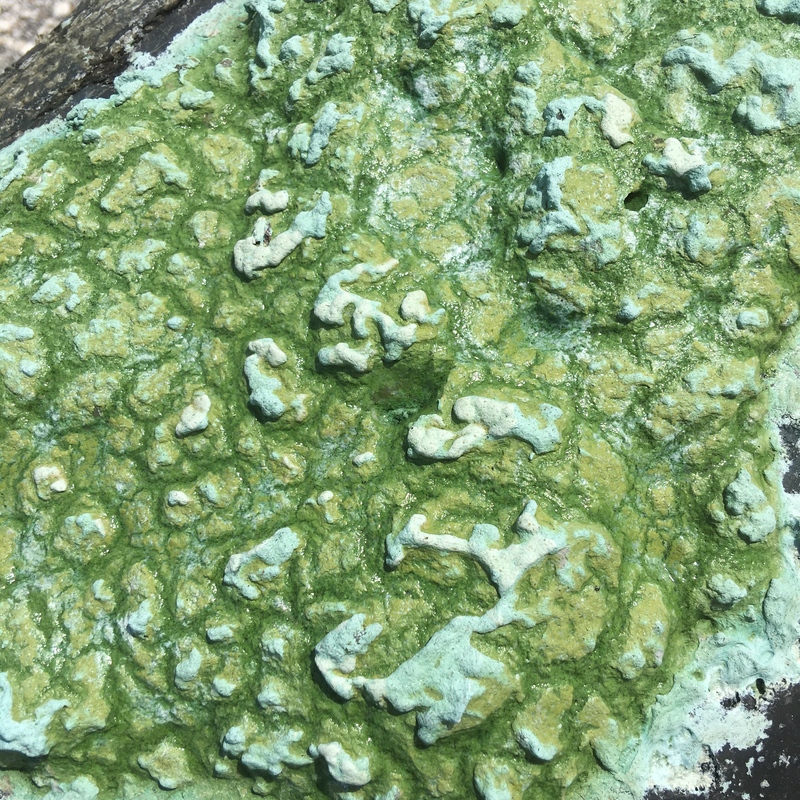 The fourth worst, for both estuaries was 2018. 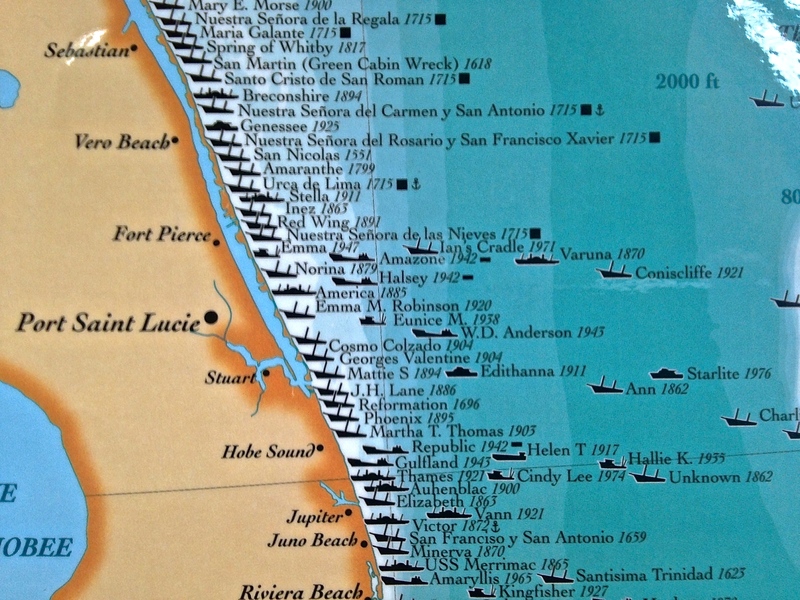 *Please note that the charts look similar below; look closely to see that the first is for the CALOOSAHACHEE and the second is for the ST LUCIE. Thank you Todd for these awesome visuals! Go to http://eyeonlakeo.com, Todd’s website for more ways to easily access and compare Calooshatchee, St Lucie and other information.